So far this season we are yet to see the Spurs side that impressed so much last season under their coach Mauricio Pochettino reach the heights of last year. Some in the media have put this down to difficulties faced with playing their home matches at Wembley as they wait for a new stadium, in truth however it may have more to do with the traditional slow start from Spurs and in particular Harry Kane. Now with the first international break of the season behind us there is a definite sense that Spurs are ready to kick on and challenge again at the top of the table. Everton on the other hand are coming off a season in which there was significant investment in the first team squad, arguably at the expense of some of the talented young British players that impressed last season, but they are yet to fully convince so far this season. Indeed there was been little to suggest from the opening rounds of fixtures that Everton are ready to break in to the top four in the Premier League. With off field issues proving a potential distraction for Wayne Rooney it remained to be seen first of all whether he would play and secondly whether he would play as well as he has been in the first two games this season. Indeed it would be interesting to see whether Ronald Koeman would be able to make room for all of the clubs central attacking midfielders without sacrificing width. Everton started the match in a 4-2-3-1 system but with a slight wrinkle. In the attacking midfield line they lined up Wayne Rooney, Davy Klaassen and Gylfi Sigurdsson but with the exception of the Icelandic international Sigurdsson who spent time out on the left hand side the three were relatively narrow and tried to overload the central area as often as possible. In behind the three attacking midfielders Koeman favours a double pivot of Morgan Schneiderlin and Idrissa Gueye, these two provide effective defensive support that allow the three attacking players to concentrate on the attacking phase. The potential weak link in the Everton starting line up came with the addition of Cuco Martina at right back, it was something of a surprise that Everton moved for the fullback after a less than impressive period at Southampton. Spurs on the other hand started in their now expected 3-5-2 system with their new Colombian international defender Davinson Sanchez at the centre of a three man backline. Moussa Sissoko played in the centre of midfield along with Christian Eriksen with Eric Dier continuing to play at the base of the midfield. Despite young right back Kyle Walker-Peters impressing in the first game of the season Pochettino continued to prefer the more experienced Kieran Trippier. Under Mauricio Pochettino Spurs are well known for playing a high pressing game, the Argentinian coach prefers his side to immediately pressurise the opposition as they look to disrupt their opponent as they look to build up in to their attacking phase. This match was no different and Everton found it extremely difficult to build effectively from their defensive third. 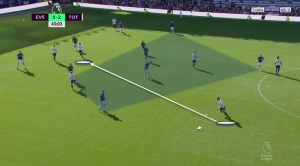 The pressing from Spurs was man to man and they worked hard in order to not only close down the Everton defenders but to position themselves intelligently to effectively close off passing lanes that Everton could potentially use to easily escape the press. Here you can see the ball in the possession of the Everton defender as they look to play in to the middle third to start their attacking transition. Immediately Spurs commit four players in to their high pressing structure to press man on man against the Everton defenders. Each passing option for Everton is closed down by a Spurs player whilst the man in possession is challenged in order to try to force either a quick turnover or a hurried pass that could be exploited. The ball back to Pickford is open but should the ball reach the goalkeeper he would still have to play a long ball to get through the Spurs pressing movement. A similar story here as Everton have possession deep inside their own half of the field. Once more Spurs have moved forward to press and engage the ball carrier before they can look to play the ball forwards. The ball near player is positioned intelligently as he closes down the man in possession whilst also using his body as a shield to prevent the short pass across to the Everton central defender. Once more all comfortable passing options for Everton in this example are closely covered by Spurs, this again forces Everton to bypass the next level of the field and takes them out of their comfort zone as they build up in to their attacking phase. Whilst Spurs have suffered something of a slow start to this season the same cannot be said of their Danish international playmaker Christian Eriksen. Both in the opening two games of the season and in the two Danish matches during the international break the attacking midfielder has shone and impressed. Whilst Spurs fans and coaches alike are in no doubt about Eriksen’s qualities as a football player there were still some questions regarding his lack of consistency. Those questions appear to have been answered at the latter stages of last season and the opening matches this season as Eriksen has become one of the key players in the Spurs tactical system. In this match the ability of Eriksen to constantly find and occupy pockets of space in the final third of the pitch provided a constant threat for Everton and insured that Spurs were able to build up safely and effectively. Here we see a situation where Eriksen has just received a forward pass from Tody Alderweireld who has spotted the playmaker and space and played a direct ball in to his teammates feet. Note that as Eriksen takes possession of the ball he has drifted out towards the left half space and even though there are three Everton defenders in the vicinity he is not closely marked by any of them. In receiving the ball in these area he then forces the hand of the Everton defenders who will have to break their defensive structure in order to close him down. This in turn creates space that can be exploited by Spurs. This time the space that is occupied by Christian Eriksen is even more concerning for Everton given that it is on the edge of the penalty area. Spurs are in a sustained attacking phase and whilst the initial attack has been turned away by Spurs we can see that Everton have problems defensively. As the ball breaks out to the edge of the penalty area Eriksen has again identified space that can be exploited and he has immediately occupied that space. In making these movements Eriksen effectively continuously provides dangerous passing options for his teammates. This match saw new signing from Ajax Davinson Sanchez make his debut at the heart of the Spurs three man defensive line. Whilst the Colombian international was an influential distributor of the ball last season in Holland in this match his brief was to keep it simple and to feed the ball left or right to Jan Vertonghen or Toby Alderweireld. Under Pochettino Spurs constantly look to build their attacking phase with their central defenders taking responsibility for passing forwards in to dangerous central areas. Here we have Toby Alderweireld in possession on the right hand side for Spurs. The first thing to note is that the the Belgian international is under extreme pressure from two Everton players who are looking to win the ball back and counter attack. With the positioning of players in the Spurs structure there are two potential passing options for Alderweireld to pass through the Everton press. Of course it is equally important that the man in possession has the quality and technical ability to make this pass. With the addition this season of Sanchez it certainly seems that Spurs now have three central defenders who are capable of distributing the ball. This time the ball is on the left hand side and Jan Vertonghen has possession as he moves in towards the final third of the field. The pass this time is made in to central areas as Vertonghen fires a direct vertical pass in to the edge of the penalty area. This single pass breaks the lines of opposition pressure and cuts out five defensive players in one movement. On paper the 3-0 scoreline for Spurs perhaps flatters them slightly but they were comfortably the best team going forwards. Everton struggled with a lack of width and their three attacking midfielders at times got in one another’s way as opposed to finding space to play in. Spurs were clinical and strong in the attacking phase seeming capable of creating and exploiting space at will, it does however remain to be seen whether they have the squad depth needed to contest effectively domestically and in Europe.